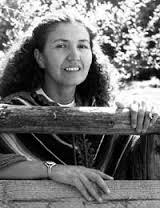 In 1989, Jeannette Armstrong oversaw the creation of the En’owkin International School of Writing for Native Students in conjunction with Theytus Books, Okanagan College and the University of Victoria’s Bachelor of Fine Arts program. Situated in downtown Penticton, it became a focal point for aboriginal writing throughout North America. The school has since re-located to the Penticton Indian Reserve. For several decades Jeannette Armstrong was the most integral, contemporary figure in the growing constellation of aboriginal authors of B.C. 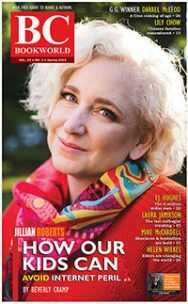 She grew up hearing stories about her mother’s great aunt, the novelist Mourning Dove, who lived briefly in Oliver, B.C., and who also taught Armstrong’s mother in school. Mourning Dove, who died in 1936, twelve years before Armstrong was born on the Penticton Indian Reservation in 1948, wrote Cogewea, the Half-Blood (1927), possibly the first novel to be written by an American aboriginal woman. 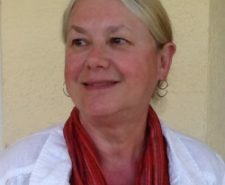 As an assistant professor of Indigenous Studies in the Irving K. Barber School of Arts and Sciences at UBC’s Okanagan campus in 2013, Armstrong was appointed a Canada Research Chair in Okanagan Indigenous Philosophy, an award of $100,000 for five years to research, document, categorize and analyze Okanagan Syilx oral language literature. “The role I have in my family is as an archivist, recorder of history and knowledge-keeper,” Jeannette Armstrong told Alan Twigg in a televsion documentary. 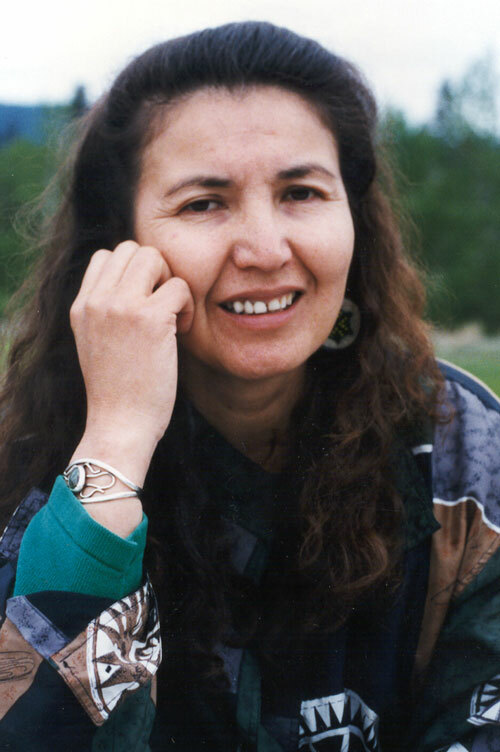 In addition to Mourning Dove, Armstrong was influenced by the cadence of Pauline Johnson’s poetry, the mentoring of Okanagan storyteller Harry Robinson and the proximity of Summerland-based playwright and novelist George Ryga who provided an introduction to Armstrong’s first novel Slash (1985). Slash was promoted in the Theytus Books catalogue as the first adult novel by a Canadian aboriginal woman. Lee Maracle’s earlier Bobbi Lee, Indian Rebel (1975), as a synthesis of autobiography and fiction, provides grounds for disputing that claim. Armstrong’s best-known non-fiction book is Native Creative Process (1991), in collaboration with aboriginal architect Douglas Cardinal. She has edited, contributed to, and written numerous other works, including poetry. After Theytus Books became one of the earliest aboriginal-owned publishing houses in Canada in 1980, it moved its headquarters to downtown Penticton in the mid-1980s. 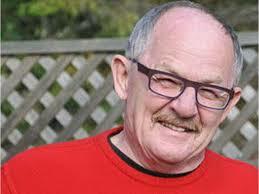 Similarly, Pemmican Books in Winnipeg was started by the Manitoba Métis Federation in October of 1980. Pemmican is an arm’s-length affiliate of Manitoba Metis Federation, which provided backlists from two earlier imprints — The Metis Press and Editions Bois-Brules. She has received the Mungo Martin Award in 1974, the Helen Pitt Memorial Award in 1978, an Honorary Doctorate of Letters from St. Thomas University in New Brunswick in 2000 and the 2003 EcoTrust Buffet Award for Indigenous Leadership. Armstrong was appointed one of seven Indigenous judges to the First Nations Court of Justice called by the Chiefs of Ontario. She received an Honorary Doctorate of Law from UBC Okanagan in June of 2006. Influenced by the cadence of Pauline Johnson’s poetry, the mentoring of Okanagan storyteller Harry Robinson and the example of Summerland-based George Ryga, Armstrong also recognizes the influence of her mother’s great aunt, the novelist Mourning Dove, who lived briefly in Oliver, B.C. and taught Armstrong’s mother in school. Jeannette Armstrong’s second novel, Her Whispering in Shadows (2000), can be read as a companion novel to Slash. It follows the life and times of Penny, an Okanagan artist and single mother who has contracted cancer after her exposure to pesticides while working as a fruit picker in the Okanagan Valley. An environmental activist, she travels the world in support of other indigenous cultures, gradually developing her own political and social theories. 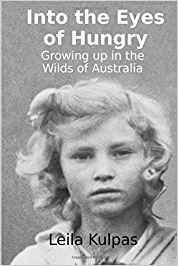 While beset by “globalization and supremacy deceit and grudging paternalism,” Penny ultimately comes to accept her place in the universe, comforted to know she will be returned to the earth when she dies. Jeannette Armstrong, 2016. Photo by Laura Sawchuk. Armstrong’s best-known non-fiction book is Native Creative Process (1991), in collaboration with Aboriginal architect Douglas Cardinal. She has edited, or contributed to, numerous collaborative books that include This is a Story, All My Relations: An Anthology of Contemporary Canadian Native Fiction (1990, editor); Aboriginal Perspectives of the Natural Environment (1991); Give Back: First Nations Perspectives on Cultural Practice (1992); We Get Our Living Like Milk from the Land (1993); and Looking at the Words of Our People: First Nations Analysis of Literature (1993). Her other titles are Neekna & Chemai (1984), Breath Tracks (1991), Whispering in Shadows (2000), Dancing with the Cranes (2004) and an audio book entitled Grandmothers (1995). Fluent in the Okanagan language, Jeannette Armstrong earned her Bachelors of Fine Arts from the University of Victoria in 1978. 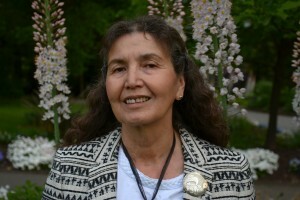 Active in the indigenous peoples’ rights movement, Jeannette Armstrong participated in the Opening Plenary of the Third World Water Forum theme of “Water and Cultural Diversity” at the Kyoto International Conference organized by the United Nations Educational, Scientific and Cultural Organization in March of 2003. Her water poem for that conference, ‘Siwlkw’, was first published on UNESCO Canada’s website, then republished at the outset of Sky Woman: Indigenous Women Who Have Shaped, Moved or Inspired Us (Theytus 2005 $24.95), edited by Sandra Laronde. As a child Jeannette Armstrong witnessed the large salmon harvests on her people’s lands which later declined to almost nothing. 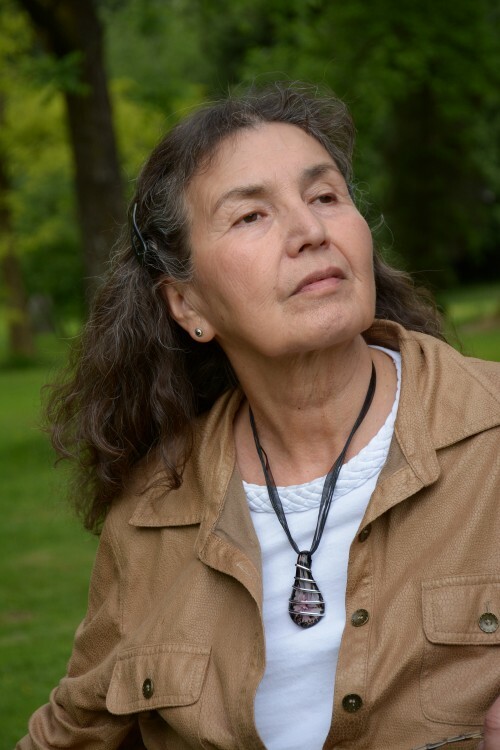 She has referred to her mother as “a river Indian,” someone who was deeply connected to the traditional fisheries of the Columbia River system. Consequently the loss of the salmon run for her people has resulted, for her, in “the deepest possible grief.” Revering water and salmon as inseparable, she pledged in 1998 to “forge something new, a new course chosen for the right reasons. A course insuring the preservation of the precious gifts of life to each of us and our generations to come as true caretakers of these lands.” After a team of researchers gathered a wealth of information from and about the indigenous cultures along the Fraser River, Jeannette Armstrong and Gerry William co-edited River of Salmon Peoples (Theytus Books 2016), a book focussed on the waterway’s most valuable resource, the salmon. Nine communities were consulted over a two-year period to gather research, photographs and artwork that complement the oral narratives of each community and the book’s exploration of the environmental challenges now facing the waterway and its contents. Armstrong, Jeannette. Slash (Penticton: Theytus Books, 1983, ten reprints). Novel. Armstrong, Jeannette. Dancing with the Cranes (Theytus Books, 2004). Illustrated children’s book. « How do I know God loves me?